After a break of nearly two years we were looking forward to a night at the Wensleydale Heifer in West Witton. The place is an old coach house converted into a “Restaurant with rooms”, the atmosphere is very relaxed and The Lad is made welcome. The WH holds the Guiness Book of Records record for the largest serving of it’s signature dish….. Fish and Chips, a 40lb halibut fillet and 60lb of chips were fried in a specially made fryer and fed to 250 eager guests. 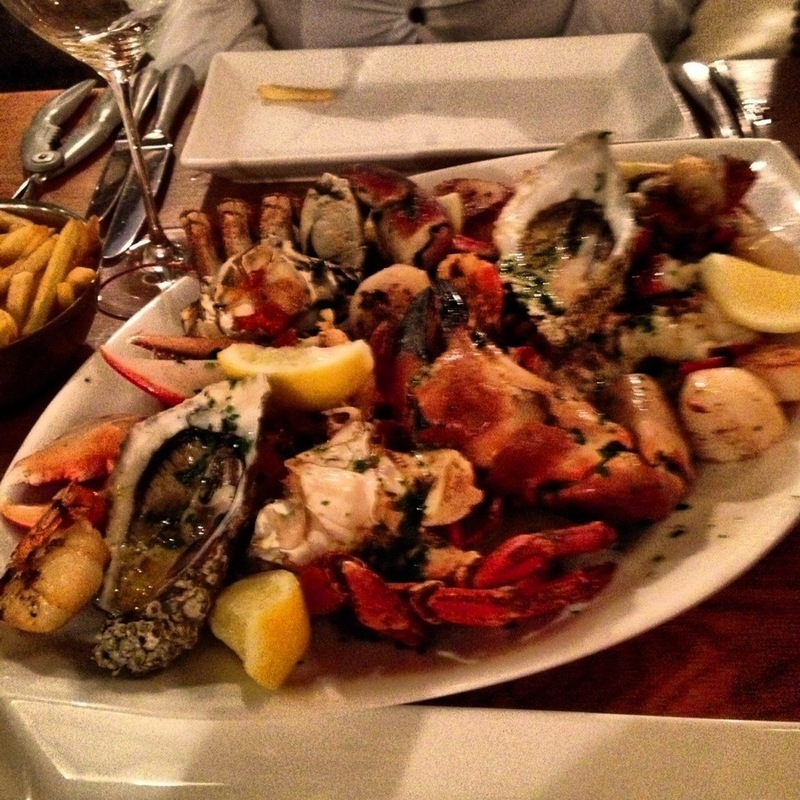 The seafood is as good as you will get except for the very top end fine dining restaurants. We went with a couple of friends who are global foodies and the comment of ” I could actually happily order any dish on the extensive menu” speaks for itself. The menu is changed weekly and there is usually several specials on offer. We arrived at 2 ish after a lovely walk around the magnificent Aysgarth falls which are a 5 minute drive away. The ladies were peckish so they shared a couple of sandwiches, cheese and tomato and a BLT both made with fresh crusty bread and were thoroughly enjoyed. G had his customary two pints of Black Sheep bitter which he says is kept perfectly. Mains were, simply grilled half lobster with garlic butter, Catherine had sea bass and parmesan risotto, both dishes were very good. Linda and G went for a spectacular seafood platter of lobster, scallops, prawns, oysters and snow crab claws which was amazing. A plate of 4 local cheeses for 1 was enough for all of us after all that food. 3 bottles of house Sauvignon Blanc complimented the fish well. Breakfast is a good choice of cereals, fruit, yogurts, fresh juice, kippers up to a full English but you do need to be very hungry. Most of the rooms in the coach house have had a refurb and are comfortable and well presented although the rooms above the kitchen area can be a bit noisy and have a lingering smell of food, they have air con installed but I prefer to have an open window..deluxe rooms in the new building include themes such as A night at the Movies, Champagne and True romantics. 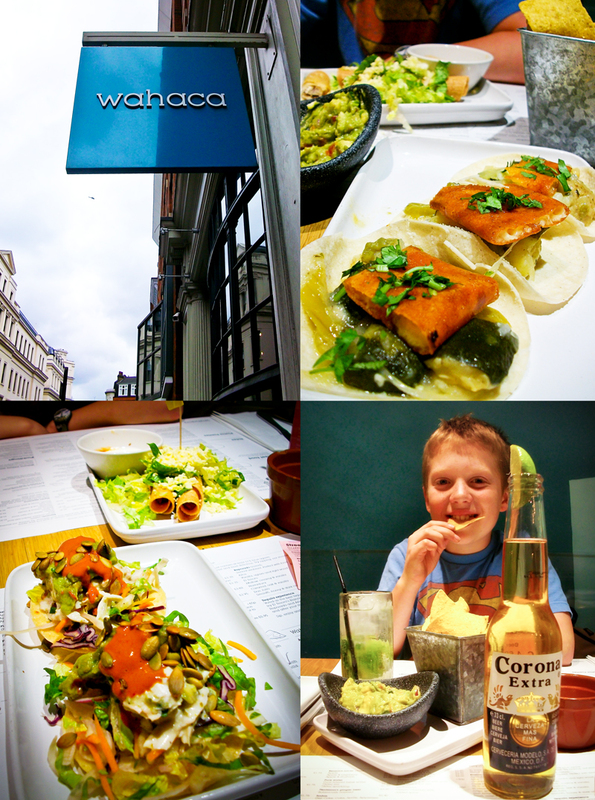 On a walk across London to collect our Paralympics Opening Ceremony tickets we, quite by chance, stumbled across a Wahaca. We had no plans for lunch, other than to try something new, so as soon as my son realised there were Churros on the menu we decided to give it a go. It was a bonus for us that they don’t take bookings as we were able to stroll straight in and were taken down to the brightly decorated basement seating area. We have Thomasina Miers ‘Mexican Food – Made Simple’ Cookbook so I knew we were in for something spicy. The waiters were great at suggesting milder options for George though, or offering to put the spicy salsa on the side. Because we wanted to make sure we tried lots of different things on our trip the Street Food part of the menu was ideal, allowing us to try several smaller plates of food, leaving room for something else later. I started with a beer and the boy had a freshly made lime and mint soda to wash down the tortilla chips with an excellent guacamole that we both loved. This must have been obvious to our waiter as he offered to refill our tortilla tin; we finished them off in seconds. Next we had Cactus Tacos: Pretty damned spicy grilled cactus with courgette, topped with grilled cheese on soft corn tortillas. My favourites were the Chicken Guajillos and George loved the Taquitos, so much so that we had to try to recreate them at home. The boy got his Churros that came with a cup of strong dipping chocolate. I thought it was nice that the waiter said we were welcome to just come in for Churros anytime, no need to have a whole meal if that was all we fancied. It’s a good place to stop off for something fresh and tasty for lunch and it seems that Wahaca’s are popping up all over the place as we saw one later at Westfield, just outside the Olympic Park. The Street Food dishes are all under £4 too, so it’s good value. We’d definitely go again, not least because we didn’t take Ed, so he wants to join in on our next visit…perhaps then we can hit a few of the 100% Blue Agave Tequilas. Saturday night and we decided to eat at our local the Duke of York. It has a new lady chef and we’d heard a few good things so we thought “lets give it a try” Pat and myself had steak and ale pie with seasonal vegetables I had chips whilst Pat chose crispy new potatoes. Tony had the burger with relish salad and chips. The gravy served with the pie was a first for me it had a hint of rosemary and was devine. All meals were accompanied by a couple of glasses of Australian shiraz and….we listened to a live band The International Party Doctors. All in all a good meal, well presented ,good value and extremely tasty. The band weren’t bad either. It was good to see the Duke of York very busy again. Long may it last. Sunday lunch is always a good benchmark for trying out new dining experiences and today we discovered a new venue that we definitely want to return to. Waking to clear blue bright skies inspired us to throw the walking boots in the car and head off for a brisk country walk. We should have set off earlier because after our lazy lie-in everybody else had the same idea and the roads were really busy and progress was slow. We decided not to travel too far so Bolton Abbey was voted the destination of choice and we opted to park and walk from the Strid. I have wanted to try No.5 Grassington House for some time after reading in Yorkshire Life it was nominated ‘Best Newcomer of the Year’ in 2009 and this was our opportunity. After a longish walk we arrived just before 16.00 and were unsure if they would be still serving lunch? We were greeted in the reception area by the owner/chef John Rudden and offered a table in either the dining room or the bar. Now at a few minutes before service was due to finish and then restart at 18.00 the genuine warm welcome and offer of a table was refreshing. We opted for a window table in the bar area which overlooks the main square in the picturesque village of Grassington where the sun was still streaming through the windows. The bar offered a good selection of hand pulled draft ales and as I was not driving on this occasion I chose the Hetton Pale Ale brewed just down the road at the Dark Horse Brewery in Hetton. I love Pale Ales and find them refreshing, not too heavy and don’t bloat, this was a good choice and fine example. A selection of breads with oil and butter were brought to the table to accompany our drinks and the staff were a delight with a friendly smile and chat. 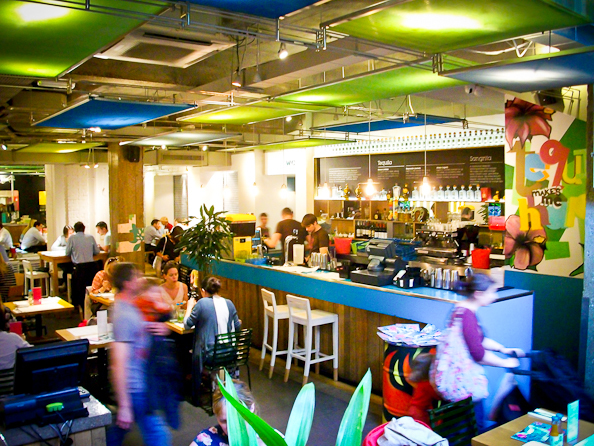 A two or three course lunch menu is offered with a good selection of dishes. Linny opted for a Mushroom Risotto to start and I chose the Hash Brown topped with a free range egg and served with an apple chutney and mixed leaf salad all served on a trendy piece of slate. The combination of textures and flavours were excellent and what appears a simple dish was a delight and something I would want to try to recreate at home. As this was Sunday lunch both of us opted for the traditional Beef and Yorkshire Pudding with roast potatoes and seasonal veg. We were not disappointed, my beef was served pink, very tender, a good thickness and cooked to perfection with the Yorkshire pudding being crisp and tasty. To accompany the meal I had a glass of house Rioja which was pleasant and robust enough to accompany the beef. Linny has a thing about Rhubarb at the moment and any opportunity is taken when offered. On this occasion a Rhubarb Fool with shortbread biscuits and mint was on the dessert menu and not passed by. The two course meal option was £13.00 and was excellent value for the high quality of food and presentation offered. A leaflet from the bar highlighted some of the special events and cookery master classes that are also on offer. Follow the web site links to discover more about No.5 Grassington House. Another snippet from the leaflet mentions John embraces the ‘Field to Fork’ principle and rears his own rare breed pigs which can be found on the menu. This was a great find and we shall return maybe to sample dinner or one of the advertised events. Bear, Mann, Horse & Groom? First post of 2010 for Johnny or for this blog ‘first past the post’. We had an invite from John & Mo to join them on a visit to top race horse trainer Charlie Mann’s training stable in Lambourn, Berkshire. With an early start required we decided to travel down and stay overnight close by at The Bear Hotel in Hungerford. The Bear is one of England’s oldest coaching inns dating back to 1464 with connections to Henry VIII, James I and William III and now offers a 39 room hotel with an award winning restaurant and bar. We had a mid afternoon start from Manchester and arrived early evening, after a quick change we settled in the bar for a much needed drink and chill after our 200 mile drive. 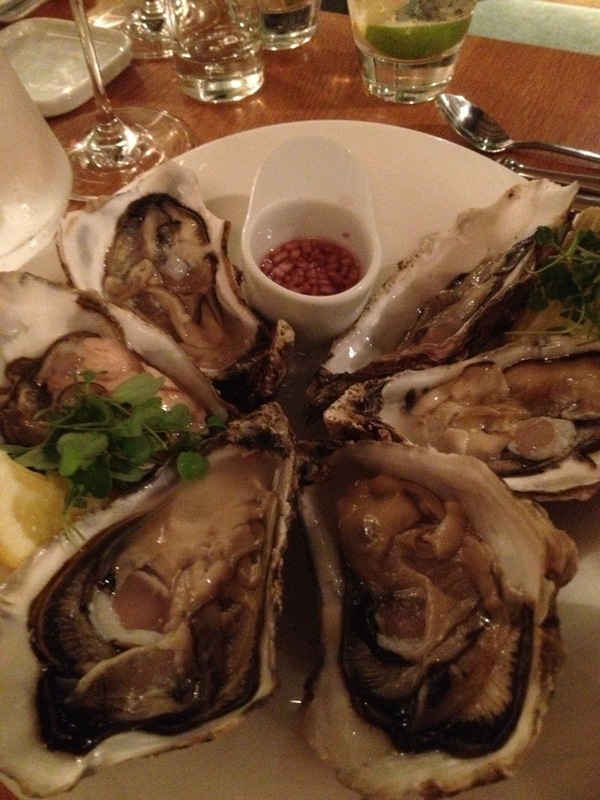 The menu covers both bar and brasserie with an extensive selection of dishes. The brasserie manager came and took our order in the bar and told us to relax and he would show us to our table when the food was ready to be served. Nice touch as we were settled and enjoying our drinks. I opted for the beer braised local partridge with ham hock, bubble & squeak and red cabbage puree and Linny chose the recommended ‘delivered fresh that day’ lemon sole. Both meals were well prepared, presented and consumed. We liked the bar atmosphere so much with the illuminated courtyard beyond that we skipped dessert and returned for a final night cap before retiring to our rooms ready for our early start the following morning. We left the Bear early to make our way to Whitcoombe House Stables, Upper Lambourn for breakfast with Charlie Mann, his family and jockey Noel Fehily. We were welcomed at 08.30 and sat down in Charlies house for a full english breakfast with copious pots of tea and toast. Charlie had already being out on the gallops for the earlier 06.30 morning run and met us at the house where we were to join him and Noel for the second session. With 60 horses in training and 63 winners in the 2009-10 national hunt season this is a busy and successful stable. After breakfast we jumped into a Land Rover and drove up to the gallops to watch the morning run. Charlie and his team made us really welcome and gave us an insight into the daily life of a top training stable. This is a 3 hour experience that can be booked on-line and I would highly recommend it. After leaving Lambourn we decided to stop for lunch on the drive home and by chance found the Horse & Groom Inn at Charlton in Wiltshire, just to carry on the theme of the day we couldn’t miss this. Sometimes you stumble on a special place by accident and this was one of those occasions. The Horse & Groom Inn has won plenty of awards for food and we managed to get a table in the Charlton bar with stone flagged floor, large open log fire and busy vibe although we could have dined in the restaurant but the bar area was our choice. The first thing noted on the menu was the inclusion of a limited two course meal for a humble ten pounds. This was my choice with a cotswold white chicken, apricot and tarragon terrine with apple chutney and brioch appetiser followed by a cottage pie with side dish of seasonal vegetables. The taste, presentation and quality of the food was excellent and how the food was offered for the money baffled me. Linny opted for a cheesy version of the classic fishcake which also got the thumbs up. Take a look at the menus on the website link and if in the area this classy gastro pub should not be missed. When Pat emailed round and suggested £15 pp bed and breakfast at the Shibden Mill Inn in return for having a 2 course dinner we were a little sceptical as it sounded too good to be true. On Pat and Tony’s recommendation we couldn’t turn this offer down. The weather was super sunny so with the top down we set off to collect Tess and over to Pat and Tony’s. After a quick progress viewing of the impressive new Priestley House we were soon at the Shibden Mill Inn and we have to say it is a pretty setting. The sun had given us a thirst so we sat outside and enjoyed drinks and nibbles. We have to admit we were apprehensive to see what kind of room you get for £30 a night…………no need to worry as our room was nicely furnished and more than adequate. Tess, Pat and Tony decided to walk to the Stump Cross Inn for a couple of drinks but D and I decided on a cheeky Veuve Cliqcout on the terrace reading poetry. Showers were followed by relaxed drinks in the bar. Dinner was simply great, starters included, mussels, mackeral, tomato/mozzarella,. The star of the mains had to be the rib of beef which Tony and G enjoyed. Pudding stars were Eton mess and chocolate crunch, both top draw. A couple of bottles of wine from a reasonable list complimented the meal. Cognacs and coffees in the bar topped off a beautiful day but we could not finish without mentioning breakfast, see it to believe it. Probably the best value Dinner B&B we’ve had.